Have you ever come across a book that sounded really interesting, but then you just never got around to reading it, because well you possibly got distracted by other equally or more interesting books? For me, that’s exactly what happened with this book/series. I found the premise really interesting, but clearly never interesting enough to pick it up right away. That is until the movie happened. And then I just had to get to it immediately. Because well what can I say, it’s one of the many bookish quirks I have. I always need to read the book before I see the movie. Unless of-course it is a genre/plot that doesn’t interest me at all. Which is why, an adaptation getting released, always guarantees a book getting bumped up on my TBR. Which I may or may not have picked up otherwise. Anyway, that’s how I came to read this book/series, which is what I’ll review today, along with my thoughts about the adaptation. 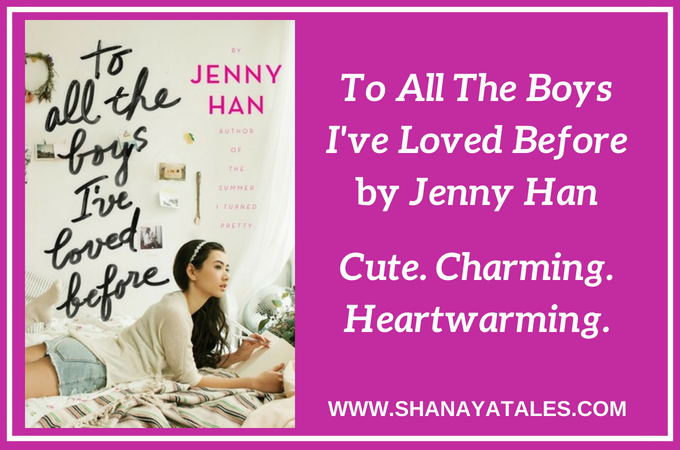 The premise of this book revolves around Lara Jean and her love letters. Not letters that she received, but ones she wrote. To All The Boys She Ever Loved. Or the ones she had an intense crush on anyway. But the thing is she never meant to send these letters or even have any of them read the contents of these letters. In-fact she wrote these letters as more of a good bye note. In hopes that once she writes down all her feelings towards someone, she can finally relieve herself of them, and move on with her life. If Love is like a Possession, maybe my Letters are like my Exorcisms. — Lara Jean, To All The Boys I’ve Loved Before. And this system worked perfectly well for her. Until one fine day when all her letters got mailed. To all 5 boys she wrote them to. All at once. Which to be completely honest was quite interesting to read. In-fact the book had everything one would expect in a light, fluffy romance, and more. 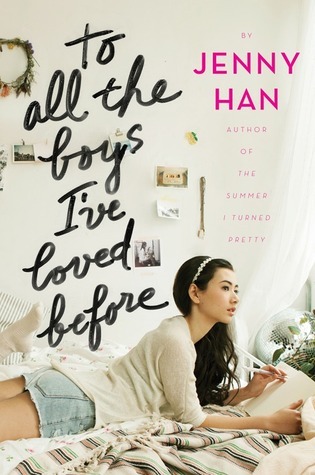 I say more, because I really connected with Lara Jean as a girl, in many (good and not so good) ways, and I loved how real her character was. Not perfect, not by a long shot, but real. I also loved their family dynamic, and how the relationship between the sisters was portrayed. Everything, from the petty fights, the underlying tensions, the power struggles, to the genuine bond of unconditional love and support – everything was so real and relatable – that I couldn’t help but care about these fictional people. And then of-course there’s the main “conflict” of the book – the letters to the boys. But I can’t really say much about them without risking getting into spoiler territory. All in All: It’s a sweet, charming, heartwarming read, which will definitely keep you entertained (so long as you don’t take it too seriously, which if you ask me, you shouldn’t). I saw this movie right after I read the first book. This wasn’t the best idea, because of a couple of reasons (which I’ll get to in a bit) but those things did not hamper my enjoyment of the movie. Overall I found the movie very cute and charming, which basically was exactly what I was expecting it to be, considering the source material. But I’ve to say that the book was loads better. And no I’m not only saying this because I believe ‘the book is always better than the movie’ or something like that. Even though it is, more often than not. In-fact I have to say that as adaptations go, this one was pretty great. They might have changed a lot of things around (some of them for no good reason) but they stayed true to the essence of the story, and I think that’s what matters most. However (and I don’t know if I can explain this well, so please bear with me) everything in the movie version seemed a little toned down, compared to the book. The characters/the romance/the conflict – everything seemed a little less than (if you get what I mean). But then I think, this was also possibly because I finished the book, and then (quite literally) 1 hour later saw the movie, which might have made me (unnecessarily) fuss over the details. Because I’m pretty sure that had I let some time pass, between the book and the movie, I would have loved the movie adaptation more. Especially because there were so many great things about this adaptation – they captured the spirit of the story, the casting was spot on, and what’s more, even the characters (for a change) did look 16 (or close to it anyway). So you see..the adaptation did have a lot going for it. I possibly just needed some time and space between the two versions. That being said, I still shouldn’t have seen the movie after having only read the first book. Because the climax of the movie contains spoilers from Book #2. Now don’t get me wrong, I don’t blame the movie makers for the spoilery content, because well Book #1 ends on a cliffhanger, and if they had to give some closure to the movie audience, they had to borrow from Book #2. It’s just that when I finally did get to Book #2 (which btw is my current read) it was difficult to not confuse the altered plot lines. And again, the book version (of the story) was so much better that I regretted seeing the movie before having read it. So if you share my quirks, I’d recommend you to read Book 1 & 2, before you see the movie. However, even if you don’t care about the book(s) at all, you must check out the movie if you are looking for a cute and adorable romance. That’s all from my end folks. I’d love to hear from you. Did you read the book/series? How did you find the movie? Do share! I’ve been curious about the storyline and the only reason I am hesitating is because of the YA angle. I am still not sure if it is a genre I will enjoy, not sure why. Oh and regarding the ‘book being better than the movie’ bit, I don’t agree with that always either. I felt the movie ‘Gone Girl’ was better than the book, although many people will disagree with me. 😉 As always SPOT-ON review without spoilers. One of the reasons I always like your reviews. Oh I understand. I wouldn’t have gotten to half (or quarter) of the books I read if not for the excellent public library system here. And not having Netflix IS a boon. I have gotten better at resisting but it’s a terrible temptation. Especially if you start a series, which I stay away from these days. Standalone movies are easier to resist, and even if I give in, not as big of a time commitment. I haven’t read the book Gone Girl, but have seen (and loved) the movie, even though it’s not a genre I normally enjoy, so I can see how that might have been better than the book. Shanaya Tales recently posted…Crazy Rich Asians – Worth The Hype? I watched the film recently and I loved it. I didn’t know there was a book. And now I find it’s a trilogy. In any case I cannot get my hands on them – they’re not in our library and I’m not buying just yet. To that extent I’m glad I watching the film. I loved their family dynamic too – how close they all are to their dad and to each other. Also, what you said about watching a film right after reading the book – that’s true. One should never ever do that. I recently watched Gurnsey Literary and Potato Peel Pie Society and I liked the film only because I’d read the book ages ago. That said, the book always trumps the movie. Yes, I see it now. It’s better to have some time and space between the two versions (book and screen). I am definitely going to ensure to space them out going forward. I am yet to see the guernsey movie, but I haven’t read the book either, so will get to that first (it’s on hold in my library), and then take some time before I see the movie. Didnt know this existed….. But talking about something Similar. I did this with Me before you.Didnt quite get to read the book for a long time, despite the positive reviews that poured it. And when finally I got to read the book, I followed it up with the movie. I was so disappointed with the movie that have decided never to do this again. I can completely understand. This book/movie has been the tipping point for me. Never again. Never again I am going to consume two different versions of the same story back to back. A very crisp review. I’ve heard about the movie but not watched it yet. I will probably go with your suggestion and the read the books (both parts) before watching the movie. This is a movie? I thought it was a series! It does. Noah Centineo – so dreamy! I am clearly living under a rock because I have neither heard of the book nor the movie. But now my interest is piqued. I think I would enjoy reading the book and definitely watching the movie. Let’s see when I can get to them. You could check out the movie on Netflix, it’s a Netflix original, if you aren’t able to get to the book. It does justice to the story. I ALWAYS read books before movies, too! Love the review! This is now on my To-read and to-watch list. Thanks for sharing. I haven’t seen the movie or read the book, but I think I need to do it ASAP. I didn’t even know there were 3 books! Seems interesting by the way it’s taking over the internet. I guess I just got banished into oblivion from books after graduating high school . Neither have I heard about the movie. But the plot really has gripped my interest since the protagonist comes across the kind of girl I secretly used to be in my teens 😉 And I really think reading the book would take me back in time when I had no whims of having a soul mate for life. A crisp review. I will go by your suggestion and read the books first. I saw your post trending on Twitter and then saw the Netflix ad- that was it! I watched the movie and loved the boy girl romance in it a lot. I have a policy that if a movie is coming out, I never reread the book close to the release date. It doesn’t benefit me! Even if the movie is terrific, being too familiar with the source material makes it hard for me to enjoy the movie version — I get really nitpicky. I haven’t read these books, but I want to, now that I’ve seen the movie and I super loved it. It was a damn delight! I cherished every moment! I know, right? It’s such a lose-lose situation. Even if you loved the story and thought the movie was really well made, you cannot fully enjoy it if you are too close to the source material. You can’t seem to not fuss over the terribly tiny, possibly irrelevant details, and it’s such a killjoy. Never again, though. This book/movie has been the tipping point for me. Going forward I am always going to allow space and time between two versions of the story. I loved the whole TALTBILB trilogy and the movie as well. I did the same as you, bumped up the books so that I could watch the film. I heard the movie sequel is on the way as well and I am super excited. Gayathri recently posted…Can you guess the book title from its quotes? I knew there will be a sequel, considering the ending..but I had no idea it was already in the works. That’s great news! I know! The prices are outrageous! And definitely not worth that kind of investment! I hope you are able to source it from some library around you. Not sure if you have access to one.